Hello, folks. One of my all time favorite books is Wonder by R. J. Palacio. It's a fantastic book about a boy named Auggie who was born with a facial deformity that, up until now, has stopped him from going to a regular school. As Auggie enters fifth grade at his new school, he wants to be treated like an ordinary kid - but unfortunately with his extraordinary face, it's not an easy transition for anyone involved. The story of Wonder is told from several points of view - Auggie's, his classmates, his sister, her boyfriend and others. It's a masterfully written tale on one community's struggle with empathy, compassion, and acceptance. If you haven't read it, it's MUST READ to add to your reading list. 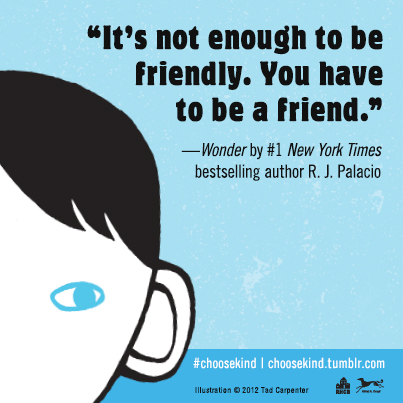 There are a few more great books that have "choosing kind" as one of their messages. Sharon Draper's Out of My Mind is another wonderful example. 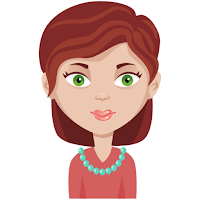 Melody is an eleven-year old with a photographic memory. She's the smartest kid in her entire school, yet NO ONE knows it. Melody cannot communicate or move on her own, so most adults don't think she's capable of learning. They are so wrong. Being unable to speak is making her go out of her mind, until she is given a tool that will allow her to speak for the first time ever. As she enters a regular education classroom, will she be accepted by her peers? This is another story of acceptance and how it feels to be excluded by your peers. Some picture books that support the theme are The Recess Queen by Alexis O'Neill, A Bad Case of Stripes by David Shannon, Piggy Monday: A Tale About Manners by Suzanne Bloom, One by Kathryn Otoshi, or Exclamation Mark by Amy Krouse Rosenthal. "Courage. Kindness. Friendship. Character. These are qualities that define us as human beings, and propel us, on occasion, to greatness."